The Edmonton Oilers have claimed forward Adam Cracknell and defenceman Adam Pardy off waivers, so that’s something. While the trade deadline day festivities have been lacklustre thus far, the Oilers have been busy making arrangements and these waiver pickups are interesting enough to explore. Cracknell was put on waivers by the Vancouver Canucks on Sunday and there was a local theory going around that this was designed as a way for the 30-year-old from Prince Albert to make him available for the AHL playoffs. Obviously, that didn’t pan out. Cracknell has 10 points in 44 games this season. 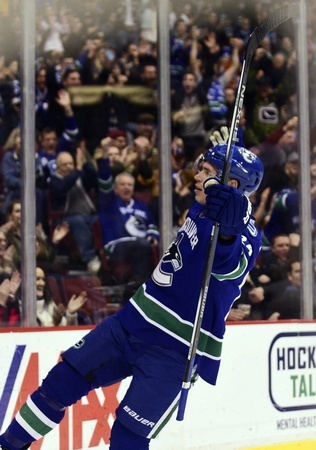 In 126 career games with the Canucks, Columbus Blue Jackets and St. Louis Blues, he has 27 points. Pardy was put on waivers by the Winnipeg Jets on Sunday and many didn’t see it coming. The pending unrestricted free agent only played in 14 games this season. The 31-year-old from Newfoundland has just an assist this year, but he’s a big player at 6’4 and 227 pounds. Together with Cracknell, Pardy gives the Edmonton Oilers a considerable size upgrade. Also among the waiver wire pickups was Mike Brown, who was picked up by the Montreal Canadiens. The 30-year-old winger from Northbrook was drafted by the Canucks in 2004 and has found a limited role in the NHL, collecting 751 penalty minutes in 393 career games with Vancouver, Anaheim, Toronto, Edmonton, and, most recently, San Jose. In 44 games with the Sharks this season, Brown has three points and 63 penalty minutes. Brown will be brought in to provide a protection role for some of Montreal’s younger players down the stretch and he’ll drop the mitts a few times before season’s end. The New Jersey Devils plucked David Warsofsky from waivers, too. The 25-year-old defenceman has one goal in a dozen games this season with Pittsburgh and also spent time in the AHL. He was drafted by the St. Louis Blues in 2008, when he was selected 95th overall. He’s seen just 22 games of NHL action and has four points.